For the past three years I have watched annual advance press for a particular benefit concert with a combination of intrigue and fear. As a Judy Garland fan I am constantly wary of works presented and acts committed “in her name” and my reactions to these events can range from joy to chagrin. (Oh, I won’t list them for you, but they range from theatre outings to concert adventures over the decades.) My fears have abated in the case of the now annual multi-performer concert event Night of a Thousand Judys. From all reports from prior incarnations, the event is infused with humor and inspires only appreciation of the talented performers involved. The evenings — tributes to all things Judy Garland — function as benefits for the Ali Forney Center and its mission to protect LGBTQ youth from the harms of homelessness. A stunningly worthy cause and one which the woman in whose name the benefit is held would support. 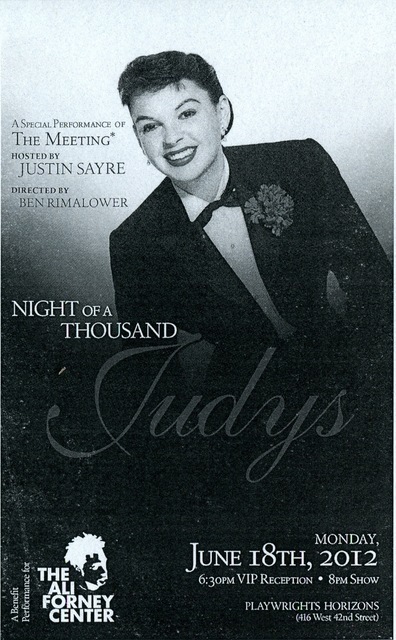 2011 Night of a Thousand Judys. Monday June 13, 2011 at Joe’s Pub. 2012 Night of a Thousand Judys. Monday June 18, 2012 at Playwrights Horizons. The show is a special installment of Sayre’s variety show The Meeting — a monthly “gay romp through politics (sexual and otherwise), social news, music, comedy skits, and other important life-changing information.” The Forney Center benefit tributes began in 2011 at Joe’s Pub downtown and moved to Playwrights Horizons on 42nd Street in 2012. This year Judy is moving uptown to the Kaufman Center, and The Meeting gang is coming along with her. This looks to be a marvelous event with a wild array of singing talent from cabaret, musical theatre, and recording artists of many flavors. Come on up. 2013 Night of a Thousand Judys. 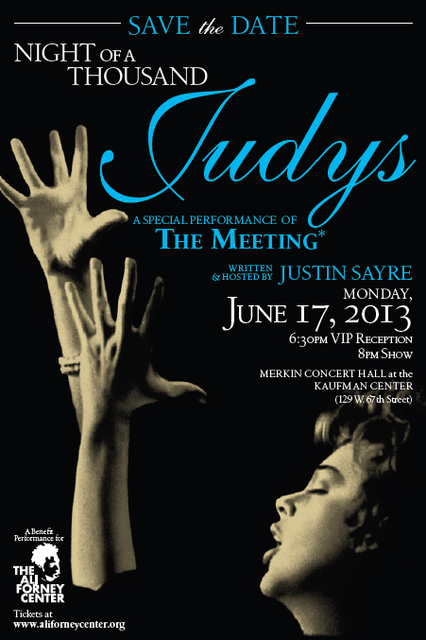 Monday June 17, 2013 at Merkin Concert Hall at the Kaufman Center.